As we have all heard by now, Hurricane Harvey took a disastrous toll on Texas, specifically the Houston area. Families were evacuated, companies closed down, houses ruined, and animals were displaced. Families have to put themselves and loved ones first, even if that means abandoning their beloved pets. This is totally heartbreaking to even have to consider. Luckily, many families were able to evacuate and take their pets along with them, but there were still many left behind. In the past, with similar natural disasters, people were told to leave their pets. After some storms, this meant over 500,000 pets were displaced, unaccounted for, or died. Not allowing people to bring their pets to safety? Some would say that’s animal cruelty! When Harvey was on its way, many local animal shelters started moving out the animals that they were caring for. Either sending them to other shelters or sending them to families who were ready to adopt them. This allowed for more room for pets they knew they would be rescuing from Harvey. After Harvey passed, hundreds of animals were found astray but crews of helpers, everyday citizens, came to the rescue. After such devastation, these volunteers truly wear super hero capes as they embark on their mission to help others. Rescue crews and volunteers brought animals to local shelters where the main mission is to care for the pets until they are able to reunite with their owners. Veterinarians came from all over to volunteer their services for these four legged friends. 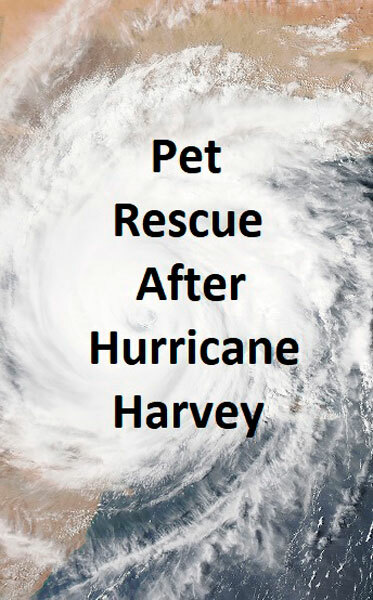 Unfortunately, some pets were voluntarily given up because their owners knew that they wouldn’t be able to provide proper care after being financially crushed by Harvey’s devastation. Animals who have been permanently separated from their owners will make their way to shelters where they will be put up for adoption to new families. Families can try to track down their pets by visiting pages of organizations like this one: Texas Hurricane Harvey Pets. Rescuers are on a mission to save pets while also putting together a database of all displaced pets so hopefully they can be reunited with their owners. Animals will wait in temporary shelter until this is able to happen. Unfortunately, some estimates predict that shelters will only be able to hold onto displaced pets for about 1 month before moving the pet into an adoption program. We wish all the best to each and every family and pet who was affected by Hurricane Harvey. Our thoughts and prayers are with you to have strength in the days ahead.